Lithe and racy, the Ibizan possesses a deerlike elegance combined with the power of a hunter. In the field the Ibizan is as fast as top coursing breeds and without equal in agility, high jumping and broad jumping ability. He is able to spring to great heights from a standstill. Perhaps you have seen Egyptian hieroglyphics with erect-eared, curly-tailed, athletic hounds, if so the silhouette might look familiar. 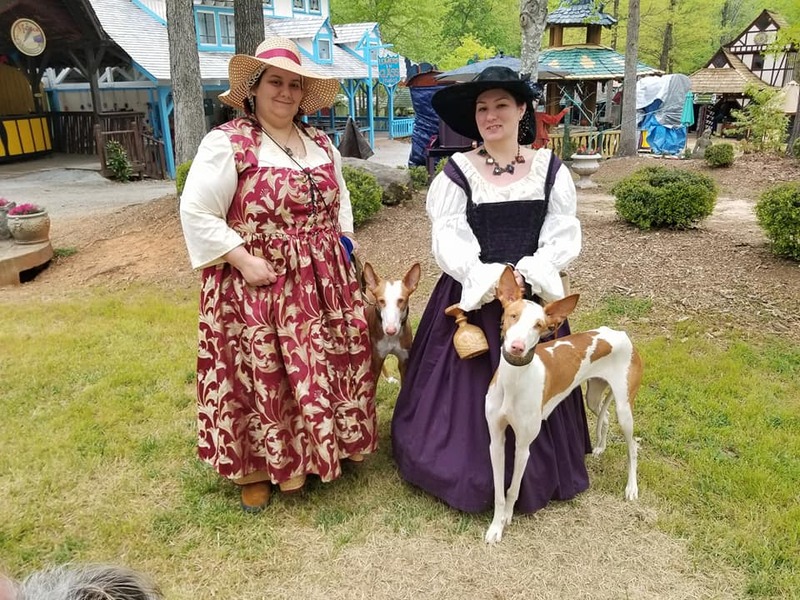 There is little doubt that Ibizan Hounds can be traced back to the same Middle Eastern dogs, the Tesem, that also eventually became Pharaoh Hounds. It is believed that the breed's origins date back 5,000 years. Hounds with similar structure can be seen in Egyptian art, tombs, and pyramids. Bones found from the Pronto-Dynastic Period date these dogs to 4770 BCE. Going back further, prehistoric cave drawings around 8,000 years old depict hunting hounds with a similar form. An interesting find was the Golenischeff plate (dating back to 3100 BCE) found at Nagada in Upper Egypt. It depicts three leashed hounds with erect ears and tall, lean bodies. Similar drawings have been found in the tombs of Hemaku, Ptolomy, and Nefermat, as well as Mereku and the famous Tutankhamen (1327 BCE). There is evidence that these ancient hounds were used in Egypt to hunt ibex, gazelle, antelope, and hare. Interestingly, there were also dog mummies measuring 22" believed to be these ancestral hounds. Comparisons are also made to the Egyptian god, Anubis. There is controversy, however, with Egyptologists on whether Anubis was likened to a jackal or a hound. The Phoenicians are credited with taking the original hounds with them on their travels. They founded the city of Gades (now Cadiz) in Spain. In the 8th and 9th centuries they took their hounds on their trading ships to the Balearic Islands off the coast of Spain. The island of Ibiza is where these hounds got their common name although in Spain (and other European countries) they are known as Podenco Ibicenco ("the dog with the air of a doe") or Ca' Eivissencs in Catalonia. One fascinating legend tells of Ibizan Hounds riding atop elephants with Hannibal (247 - 182 BCE), the Carthaginian general, when he invaded Italy. Considering that Hannibal was actually born in Ibiza and was said to have traveled with his hounds the story is very possible and believable. 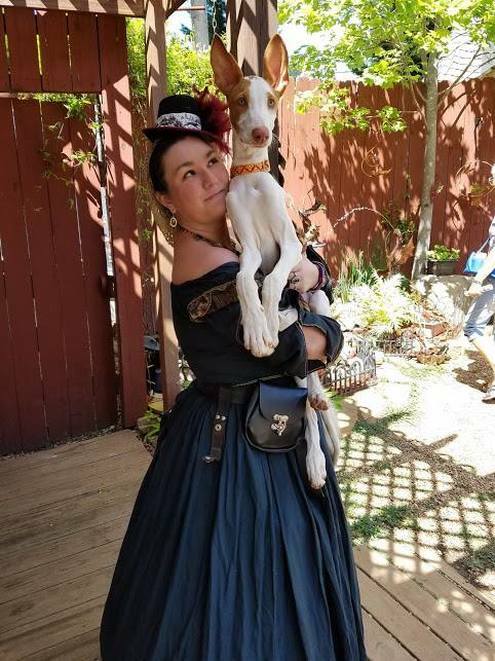 Historically, many sighthounds traveled with important people. Ibizan Hounds are known as "rabbit dogs". They course (hunt by chasing) hare but have also been known to bring down larger game, such as deer. Farmers only kept the strongest dogs with the best hunting instincts because food and resources were scarce. They often survived on fish heads, goat meat, and game that they caught on their own. Many of the males and weak dogs were cast off to sea or left on the uninhabited part of the island. Because of this only the strongest representatives of the breed survived. The breed is known to be hardy and rather healthy for a purebred dog. Ibizans and crosses are also used in the south of France by poachers. 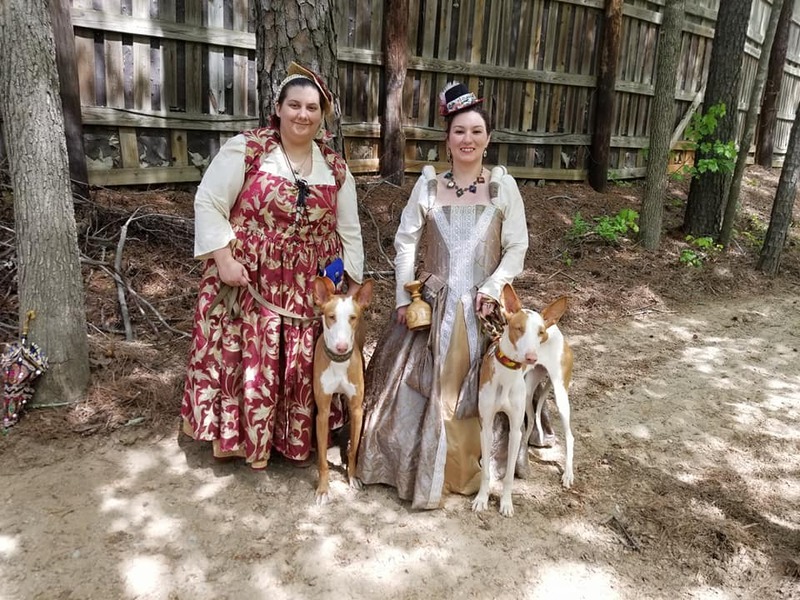 During Renaissance times these hounds would have still been used as coursing hounds in the rough, uneven terrain of Spain. There are also reports by the Celts of similar looking white hounds with red, erect ears hunting. They excel at coursing in all types of terrain. Extremely agile dogs they are also known to be both fast and impressive jumpers. They have a well-earned reputation that they are able to clear a 6' fence/barrier with ease and can twist in the air. These hounds are fast and intelligent and can follow quarry in and out of rough brush. They are known to stand on their hind legs if they lose sight of their quarry. They tend to locate their prey by scent, flush, and chase. After catching their prey they retrieve it. Generally, in Spain, 10 hounds will hunt together in packs. The term, enconillarse (go to rest), is a particular habit of the breed referring to a considerable rest that they require after a long, intense hunt. The breed came to America in 1956. Colonel and Mrs. Consuelo Seoane brought the first ones to Rhode Island. By 1965 there were 151 Ibizans reported in the U.S. Today, they are still a rare breed with relatively low numbers. In 2010 only 91 puppies were whelped and registered with the AKC. Ibizans are different from many traditional sighthounds because they use sight, hearing, and scent on a hunt instead of mainly sight. In America they are definitely categorized in the sighthound family. They are put into the primative hunting breeds category in most other countries. 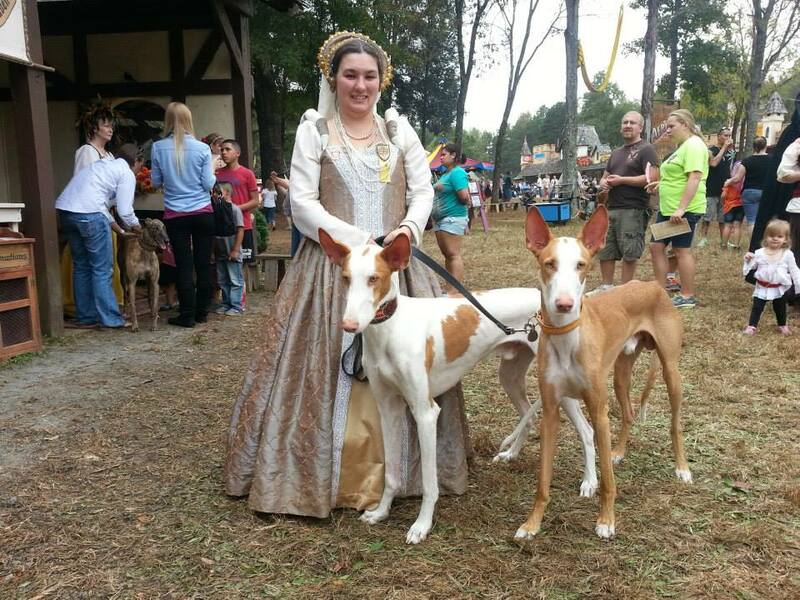 They are similar in function and type to Pharaoh Hounds, Cirneco dell'Etna, and various other podenco breeds. While they appear very elegant this is a hardy, hunting breed still used for their original purpose in their country of origin. Wickedly intelligent, they are known for a mischievous nature and are sometimes compared to a "Peter Pan" persona. Ibizan owners will tell a prospective owner that they should have a sense of humor with these hounds. The breed comes in both wire and smooth coat varieties. They are white, red, or a combination of white and red. Click here to see pictures of Ibizan Hounds. They are often affectionately referred to as "Beezers".